This simple, healthy side dish has a wonderful combination of flavors and will be ready in 15 minutes! I love birthdays. Especially family and friends’ birthdays! I love to bake cakes, get balloons and pick out the perfect gift for that special someone. But then there’s MY birthday. Eh. I am not one of those people that hate their birthday, but it’s just another day, right? Happy birthday to me! Is it weird to post a green bean recipe on m birthday? Maybe a little bit. Don’t even think I won’t be making these Birthday Cookies today and eating a whole bunch! Ok, let’s talk green beans and the holidays. I’ve had that green bean casserole with the canned mushroom soup and I think people really like it? I don’t love creamy stuff like that. But I love these green beans! This dish is simple and healthy and can be ready in 15 minutes. It’s a perfect, quick dish for the craziness and chaos of the holidays. In a small bowl, mix together balsamic vinegar and honey. Set aside. Place garlic and oil in large skillet and cook under medium heat for 2-3 minutes until softened. Add green beans and stir. Cook for about 10 minutes until green beans are still bright green and crispy. Add balsamic mixture, almonds and cranberries and mix again. Cook for another 2 minutes. Anyway, thank you for all of the birthday wishes! I am so thankful for all of you! Obviously, I eat IHOP on my birthday, which is coming up next week! WOO,. I also many have to eat these GORGEOUS green beans! 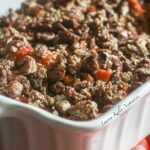 LOVE the cranberries and almonds! Pinned! The green beans look delicious and a very Happy Birthday to you! On our birthday’s they get a birthday dinner choice (either home cooked meal or eat out). They generally want to stay in and thankfully I get the same treatment on my birthday. Though half of the time I just pick something I know they can make for me, not necessarily what I would have liked. I enjoy that more. Have a great day! I love green beans. This is a new way for me to prepare them. Thank you! Happy birthday to you girl! And what a way to celebrate with this dish, sweet salty and downright delicious. These green beans seriously sound incredible. 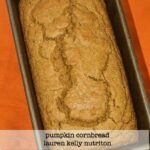 Totally gonna be on my thanksgiving menu this year! We make green beans really similar but I’ve never added the cranberries! I can’t wait to try these! I hope you like them Serena! I like the looks of YOUR green beans so much better than the usual! Happy, happy birthday! 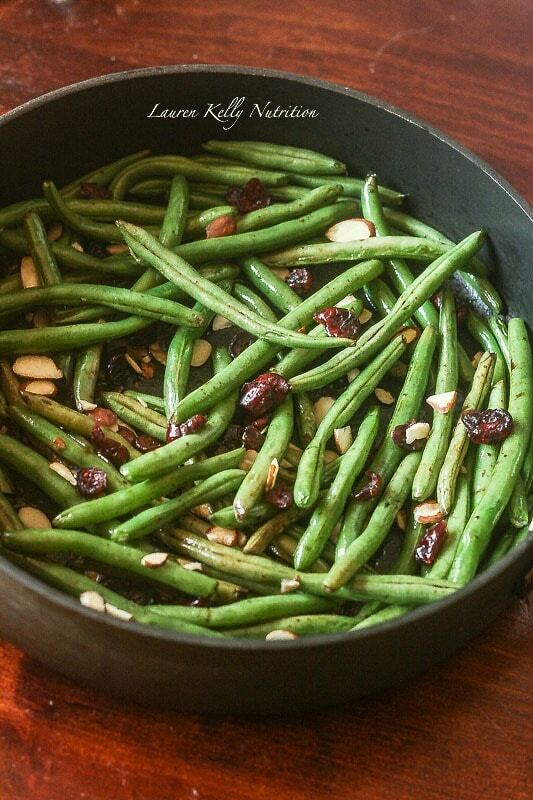 I love how festive and pretty this green bean dish is! Happy Birthday!! I love green beans with almonds, it’s one of my favorites. Adding the cranberries makes it look so festive – totally birthday worthy! Hello … hope you had a good birthday. I totally agree with you … I’m so done with stringbean casserole … I skip that one. I am definitely going to make these for Christmas! i hope you had a great birthday! My son is the same way. I make him a special breakfast, so he thinks I need to make one for myself as well. Kids are funny. 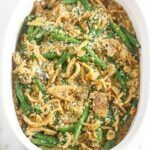 Love these green beans for the holidays or for any night of the week! Hoping this recipe will work with frozen green beans, since none of the fresh seemed, well, um, fresh…. Yes it would work Drea! And I know what you mean, they are so hot or miss these days. I hope you like it!! Good thing I have all the ingredients on hand to make these delicious balsamic beans for dinner tonight. They look incredibly delicious.. and healthy too! A relative brought this dish to Christmas dinner and I could not get enough! I’m so happy I just found it on Pinterest! Sent it to my sister-in-law too! YAY! I love hearing that Tara, thanks so much! Happy New Year! Hi! This looks delicious, but don’t the dried cranberries contain added sugar? I have yet to find any without. Do you know of a brand? For better or worse I try out new recipes when having guests over for dinner. 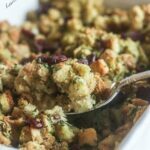 I made this recipe for the first time this past Thanksgiving and it was a hit! Thank you! Wow, that is risky, Mandy! 😉 I am SO glad you liked it! I make it almost weekly! !